A couple of weeks ago I had the privilege to facilitate a group of around 250 lawyers and legal information professionals, in an exercise to discuss, debate and create action in four areas that were key to the future of their FTSE100 business – employees, competitors, customers and products & services. Regular readers (bonus marks for you) may remember that last month, in my post “You are wrong I am right” I mentioned an idea called “The World Cafe”, which is a methodology for facilitating conversations that matter among large groups of people. It was time to eat my own dogfood (as the saying goes! ), it was time to create a monster cafe…. It proved a great opportunity to see if it could help lawyers collaborate and share information – something which *can* sometimes be a challenge! The World Café was born in 1995 from work by a group called The Intellectual Capital Pioneers. Two of the original members (Brown and Isaacs) went on to document their deep underlying research, the key principles and a host of great case studies in their book, “The World Café: Shaping our futures through conversations that matter”. You can get a flavour and more information from the website (which has some great free resources), but I do recommend the book if you are interested in exploring the idea further. Well, the World Café is a process that promotes open dialogue, information sharing and accessing the collective intelligence of a group. Sounds lofty and aspirational? Well, maybe so, but the detailed case studies covering huge blue chip organisations, public sector groups and community based examples gave me a lot of faith it could work for the group I was working with, which had recently joined together as a new department (the over-arching goal was to become “One Team”). I can think of a multitude of similar examples from my practice as a lawyer when this type of dialogue would have helped – moving from a practice area structure to sector-focused teams? Ideal. Want to get a team formed across different geographies? This will help. In-house and want to discuss key areas of risk with a variety of stakeholders? This approach can work. Working in a law firm with too many silos (surely not!)? Why not give it a try? Its principles are deceptively simple – the group (and the idea has been used for groups of over 1,000 people!) comes together in a very informal setting, around cafe style tables that seat four or five. The book explains why tables of this size are optimal for creating an environment where all can both listen and contribute, and from experience I can confirm it worked really well. As I moved from cafe to cafe (we had four separate rooms to accommodate the large numbers), I was amazed by the buzz and general level of conversation in each room. Each table has an individual host and is posed an open (and hopefully thought provoking) question on a topic that matters for the group. An example of one of the questions we posed (in the “employees” discussion) was: “What can we do to make this the best place you’ve ever worked”. As well as a good supply of hot drinks and goodies to eat, the tables have paper table cloths and pens, with participants encouraged to capture their ideas visibly by drawing and writing. This might seem superficial, but putting ideas down on paper definitely helps thoughts develop, and the drawing is designed to help encourage creativity. When I was planning the event, I talked to a number of people I knew who had hosted or attended these events. Interestingly a delegate at a workshop I was running in December for a large City firm mentioned that he had attended a World Cafe event at Hewlett Packard, and six years later he could still remember what was drawn and written on the table cloth. What a tremendously powerful testament. After 20 minutes of discussion, the cafe host signals it’s time for a change, and all the participants at a table except one (the table host) get up, split up from their current table mates, and move to another table to discuss a slightly different, but related question. The table host (who hasn’t moved) explains to the new table guests where the discussion has got to, and the conversation then continues with a new set of people, who add their own insights and of course drawings to the tablecloth. What happens (and idea the whole point of the process), is that different people bring their own ideas and these ideas develop and cross-fertilise across tables. Individuals also get to meet and share ideas with many different colleagues, which in itself made a big contribution to the overall group aim of being “One Team”. As part of the process our group did three 20 minute rounds of conversation, with approximately 15 minutes of introduction with the whole group in plenary, and then a 15 minute wrap-up (also as a large group), giving a total even time of just over 90 minutes. To make sure to atmosphere was informal (an important principle of the World Café), the company creative team did a fantastic job bringing to life the four themed cafés. With artwork on the walls, real cafe tablecloths underneath the paper, and aroma machines pumping out realistic smells, the ambience was topped off by the cafe hosts who fully immersed themselves in their roles with appropriate dress, accents and in one case, a (temporary) tattoo! In the plenary wrap-up session, people shared their experience and in addition to photographing the tablecloths, the insights and action points captured at the event, generated an incredible 250+ ideas that can be used to bring real improvements to the business, and the cafe organisers are already working on breaking these down into workstreams and getting these projects started. In my experience, lawyers are usually pretty good at talking, but the informal, small groups really seemed to encourage the listening part of the conversation. The feedback from cafe hosts, table hosts and guests was incredibly positive, and I wouldn’t hesitate to run another event. Given the change going on in the profession right now, I suspect there are many law firms looking to have conversations that matter with their teams, and this is a great mechanism to do it. The cafe theme and concept might sound a bit unorthodox, but with proper preparation (the logistics behind the simplicity do take time!) it can create magic. Not green law firms (sustainability is for another post), but purple law firms. The concept at the heart of Seth Godin’s excellent book “Purple Cow” is about being remarkable. I think that’s a great word, and today’s post is designed to make you think about how your firm, team or law department can be remarkable. To be honest, it’s not a word that is usually associated with lawyers, which is not to detract from the profession. Many lawyers perform quiet miracles on a semi-regular basis; getting deals across the line against all odds, working crazy hours pre-trial to ensure their client wins, and working pro bono to help keep a charity afloat when times are tough. However, as service standards and client expectations rise, these heroics are not enough to be seen as remarkable. Remarkable requires something more, something different. Perhaps “different” is where the problem lies. How many firms, how many lawyers, want to be different? Being different can be risky. Being different can mean failing. Publicly. But being different can also generate real competitive advantage, and it this intensely competitive world, that’s got to be worth shooting for, right? Over here in the UK, Eversheds were recently in the legal press for creating an internal competition to reward the best business development idea (see the article here: http://tinyurl.com/2buwmna) and like them or love them, this is a firm that has been prepared to go out on a limb and do things differently over the years. Whether or not the competition will be successful, we’ll have to wait and see, but while the £20,000 prize looks appealing, in the context of the profits that could be generated by a breakthrough idea, it’s small beer. So why aren’t all firms driving innovation? 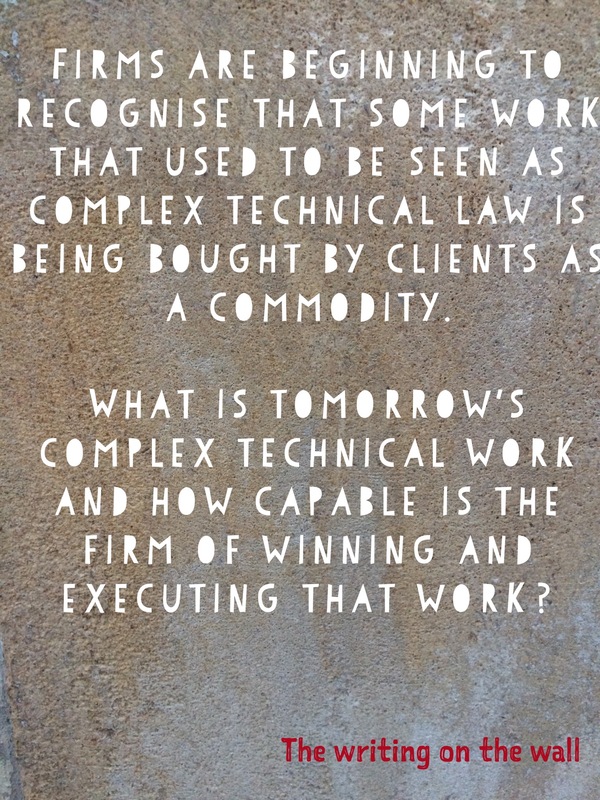 Indeed, arguably in a true culture of innovation, ideas would be shared freely and there would be an infrastructure to commercialise them quickly and effectively without the need for annual competitions, but in my experience this is far from reality in most law firms. The truth is, for management it’s often easier to cut costs to boost profit than invest time to generate future profits, and the tyranny of the billable hour often shackles junior lawyers. One of the more unique challenges that law firm face in this context is that they are full of experts (they sell expertise, right? ), and as Michalko notes in his creativity reference manual “Thinkertoys”, experts have boundaries around the limits of their expertise. As a result they tend to look for solutions within these boundaries, whereas breakthrough inventions often come from outside these limits. Michalko goes on to suggest numerous ways of stretching thinking to overcome these limits, but one of my favourites (which is easy to try: throw it in your next department meeting) is a subset of his “Scamper” exercise, called “Magnify”. Here, think about a service your team offers its clients (internal or external). What new features or functions could be added? How could it be made faster or more frequent? Could it be made enormous? (I love that one – what a great question) What else could be changed to add or grow the value it offers? Simple questions, but the answers can be surprising. Innovation and being remarkable isn’t just about having remarkable products and services. It can also be about the way those products and services are delivered. Everyone in an organisation can, and should, contribute to making it remarkable. How can you help unlock that creativity?